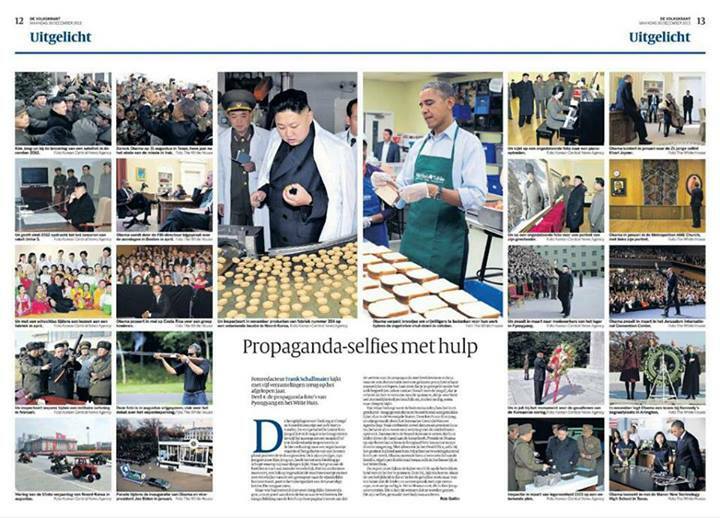 In light of the ongoing conversation about the issue of the nature of government photographer produced images supplanting independent photojournalists, on December 31st Dutch newspaper The Volkskrant (circ 250k) published a full page spread placing side to side images from North Korean leader Kim Jung Un and President Obama – in both cases, using government produced visuals. The images show both heads-of-state 1) Amidst crowds, 2) on the phone, 3) amongst school children, 4) reviewing/shooting a firearm, 5) reviewing a parade, 6) playing music, 7) looking at artwork, 8) waving to a crowd, 9) placing a memorial wreath, 10) reviewing a display on a desk, and 11) examining baked goods. It’s worth looking at this spread closely and compare the two. Produced at Jacob Bontiusplaats 9 1018 LL Amsterdam .